코빈 블루 (1989년 2월 21일 ~ )  는 미국의 배우, 모델, 가수이다. 그는 하이 스쿨 뮤지컬 시리즈, 플라이트 29 다운 시리즈, 그리고 디즈니 채널의 점프 인!으로 유명하다 . 2007년 5월, 데뷔 앨범을 발표했다. 앨범은 첫 주에 18,000장의 판매고를 올렸고, 미국 빌보드 200에 36위으로 데위하였다. 블루는 뉴욕 브루클린에서 마사와 데이비드 라이버스의 아들로 태어났다. 어머니는 이탈리아계이며, 아버지는 자메이카계이다. 어렸을땐, 블루는 발레와 재즈에 주력하였고, 몇 년 동안 춤을 공부했다. 블루는 로스앤젤레스 카운티 고등학교 졸업하였다. 1996년 조지 클루니와 함께 《ER》에 게스트 스타로 출연했다. 그는 디자이너 돈 에드 하디와 돌체 앤 가바나하여 의류를 많이 입는다. 그는 또한 레이블 펭귄의 옷을 착용과 나이키 운동화를 좋아한다. 블루는 4살에 포드 자동차사 모델링 에이전시에 모델이 되었다. 또, 로스앤젤레스 레이커스 팀의 팬이다. ↑ Bleu, Corbin (2013년 11월 4일). “Corbin Bleu’s Dancing With The Stars Blog: Redemption In The Ballroom!”. 《Access Hollywood》. NBCUniversal Television Distribution. 2013년 11월 15일에 확인함. ↑ Olya, Gabrielle (2016년 7월 24일). “Corbin Bleu and Sasha Clements Are Married”. 《People》. Time Inc. 2016년 7월 25일에 확인함. ↑ yochell says:. 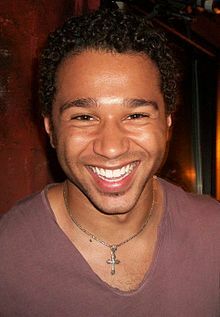 “actor Corbin Bleu in”. Relatemag.com. 2011년 8월 8일에 확인함. ↑ “Pop Songs”. 《Cobin Bleu album》. Billboard.com. ↑ “Announces Support Of Upcoming Film "RENEE" Orlando, FL – February 24, 2011”. Twloha.com. 2011년 2월 25일. 2011년 8월 8일에 확인함. ↑ Sneider, Jeff (2011년 8월 4일). “Corbin Bleu joins cast of 'Nurse 3D'”. 《Variety (magazine)》. Reed Business Information. 2011년 10월 8일에 보존된 문서. 2011년 10월 8일에 확인함. ↑ “Stephen Lang, Corbin Bleu to Topline Chiller TV Movie (Exclusive)”. hollywoodreporter.com. 2012년 12월 17일. 2012년 12월 17일에 확인함. ↑ Rice, Lynette (2013년 3월 14일). “'High School Musical' star joins 'One Life to Live'”. 《Entertainment Weekly》. Time Inc. 2013년 3월 14일에 확인함. ↑ Dancing with the Stars (2013년 9월 4일). “Meet the New 'DWTS' Season 17 Cast!”. 《extratv.com》. 2013년 9월 4일에 확인함. ↑ “Corbin Bleu – In The Heights – Official Site”. Intheheightsthemusical.com. 2011년 8월 8일에 확인함. 이 문서는 2018년 11월 11일 (일) 00:37에 마지막으로 편집되었습니다.